RESOURCE ASSISTANCE VOLUNTEERS, A Vital Part of WWCM’s Mission . . .
Dawnette Scott, one of many awesome WWCM volunteers, started in the back room at the old facility, sorting food and checking expiration dates. “I was looking for a volunteer opportunity, and to be honest it was convenient and had good hours,” she says. 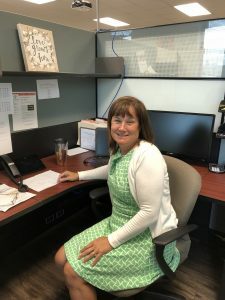 There isn’t a job she hasn’t done, but for the past three years, she’s taken on the challenging but rewarding role of Resource Assistance Volunteer. “When someone comes in who needs help financially, we meet with them one-on-one,” Dawnette explains. And while there is a certain amount of paperwork, research, and data entry, according to Dawnette, it’s really an opportunity to work directly with those who need it most.